BEA Wednesday: Forecasted Schedule & Special Bonus Feature! 2:00 - 5:00 Brooklyn walking tours sponsored by BEA. I'm headed for Fort Greene -- it's the Brooklyn neighborhood I'm most fascinated by and know the least about, though I'd love to go on every one of these tours. 5:00-6:30 ABA Brooklyn author reception -- a chance to grab some snacks and meet up with Brooklyn authors as well as all of my favorite booksellers from out of town! 7:00- ??? YOUNG BOOKSELLERS PARTY AT FLOYD! 10:00 - 6:00 It's a regular workday at McNally Robinson for me. If you're in town and have free time to visit the local bookstores, I'd love to say hi -- be sure to ask for Jessica if you stop in! 6:00-8:00 Reception for Canadian booksellers at McNally Robinson -- it's nice to be a venue as well as a partygoer. 8:00-9:30 (ha!) Children's Book and Author Breakfast -- I may or may not make it to this one, though it sounds like a great lineup, with hometown (Brooklyn) boy Mo Willems as well as my favorite indie bookstore supporter Libba Bray. 10:00 - 11:00 Blogs: Is Their Growing Influence a Tastemakers Dilemma? The Crossover Huurdle - Several of my fellow bloggers are participating in this mouthful of a panel, and I'm excited to support them with my presence AND hear what they have to say. 11:00 Meeting with the Emerging Leaders Council, to debrief on Wednesday night and talk about our strategy for the next year. 3:00 Bookselling Demand Today - a panel where we get to get back the data from a bookstore survey we participated in earlier this year, and learn how our store compares to the industry overall -- exciting if you're a wonk like me. 12:00-2:00 Book and Author Luncheon - Spies (Valerie Plame), Impresarios (Russell Simmons), Pundits (Paul Krugman), and Alan Alda. 2:00 - 3:00 Graphic Novels 360 (or The Graphic Novel Pandemic, depending on which version of the program you read) -- MY panel! I'm lucky enough to sit next to Allison Bechdel (author of Fun Home), Mark Siegel (publisher of First Second) and other comics movers and shakers and babble about what lil' ol' me thinks about the state of graphic novels. Come by to point and laugh, or ask thoughtful questions -- it's in Room 1E03. 4:00 Screening of the Ian McEwan Out of the Book film -- I'd love to preview it (since my face is in it, apparently briefly) before we host our screening later this month. 5:00 - 6:00 More show floor, or a nap. 6:00 - 9:00 Independent Press Party at the China Club. Several of my favorite indie presses (Melville House, Europa, Seven Stories, etc.) are represented here, and I've got to make up for missing Friday night. Late Night -- If I can score a ticket (I'm looking at you, Bill Getz), I am so going to the PGW party this year. I've heard that Sharon Jones, who fronts the Dap-Kings, could sing in a hurricane, and I'd like to hear that. Plus it's the traditional Saturday night bacchanalian climax to the all-pro weekend, and who am I to mess with tradition? I'm taking Sunday off. There's only so much BEA you can do in your hometown. And that will give me time to blog, right? Now, the special WN reader bennie I promised. Below you'll find a reproduction of the handout we'll be supplying at the Emerging Leaders party tonight: a guide to getting the most out of BEA. My intrepid fellow bookseller Amanda Lydon and I banged it out over breakfast based on the input of our mentors in the Emerging Leaders project, who had prescient and hilarious advice. It's geared toward young first-time BEA booksellers, but I think there's a lot here that could be helpful to many a veteran. Hope you find it helpful -- have fun, and see you at the show! Sit next to someone you don't know! At meals, sessions, and any other aspect of BEA, split up from your bookstore coworkers. One of the most valuable parts of BEA is meeting people with new and different ideas, and you won't do it if you're sitting with people you already know. Ask people what their plans are for the evening – which parties are they planning to attend? Ask people about their specific job; most people love to talk about what they do. Ask people about their store – how big is it, where is it, what kind of books do they sell? This is the easy part. Publisher sales reps make their living talking to booksellers – they'd love to meet you! Here are some ways to approach publisher booths. Jot down a list of names of frontline booksellers at your store who couldn't make it to BEA. Bring it to a publisher's booth and ask what they'd recommend for your coworkers. Ask any publisher what the big book on their list is this season, or which is their favorite new title. Attend the ABA education sessions on Thursday in any and all topics that interest you. Go up to the panelists afterwards to say thanks or ask questions. Talk to those sitting next to you about how they plan to use the information at their store. Wear your EL button – it's a great conversation starter. Publishers and booksellers are very interested in the Emerging Leaders project, so identify yourself as an Emerging Leader. Your new ideas and fresh perspective are valuable and sought after throughout the book industry. Attend ABA sessions on skills you may not need now, but may in the job you aspire to have. If you'd like to be an events coordinator, talk to publicists. If you'd like to be a buyer, talk to sales reps. If you don't have an invitation to a gathering, find an Emerging Leader who does and tag along. Or round up a group of people with EL buttons and make your own plans. Go to areas on the show floor that sell books or sidelines you've never seen. Visit small and independent publishers – they often have time to give you more attention. You might pick up information or samples that will be valuable for your store back home. You DON'T have to take home every galley or ARC that looks interesting. Get the sales rep's card, or give them yours, and have them mail you a copy. Don't weigh down your luggage or slow down your progress during the day with a million books. If you find yourself held hostage by someone who's talking too long, don't be afraid to say "Well, it was really nice meeting you – I'd better keep making the rounds." Okay, this is the lazy girl's version of a Wednesday post. Below you'll find your comments and those of your fellow WN readers on reviews, in semi-abbreviated form, broken up by category: book industry, authors, and general readers (though of course there is some overlap). It's a bit long, but I thought it might be useful to see how people with different relationships to books are thinking about this issue. I'll have my thoughts on the issue on Friday. As a person who works in a bookstore, I find that a lot of customers still come in looking for a book that they read about in the Times (NPR being a close second in popularity.) Often, they don't remember the title or the author, so I try and read the Times book review so I can remember the name of the book based on their plot summary. Hi, I work in the bookselling industry so a lot of the books that I end up reading are just books which I've stumbled across while receiving books, putting books away, selling to a customer. I DO get some of my books through blogs - not so much reviews in blogs but books which are brought up in conversation. Periodically I read the NYTBR but, if I get a book from a print review it normally comes from Entertainment Weekly. I'm constantly amazed at how often I'll find a book reviewed there which you would never expect to find in such a mainstream publication. I also get a lot of recommendations from friends and readers of one of my blogs. I would like to say that I think that, while blogs are daily becoming a better place to find great reviews of books, print reviews still hold more credibility to me - possibly because the reviewers have seemingly more reason to be listened to. The downside of print reviewers - at least in some circumstances - is that many of them are turning into the very thing they are accusing the blog reviewers of being: partial judges who you can expect a certain responce to a certain kind of book. Hence, print reviewing is important because of the established checks-and-balances that go into the publication of such. Hi - I'm replying from the perspective of an artist/writer/cartoonist who has recently published (via print-on-demand) a book, which started life as a comic strip on my blog. The decision to publish this edition myself via POD, rather than submitting it first to mainstream publishers, was influenced by the enthusiastic response I got from visitors to my blog who kept asking when the comic strip would be a book.Now that the book is out, it has received more reader-reviews (on the lulu.com site where it is on sale) than most new books would get from the mainstream press. Yet, because we live in a world where success is determined by media coverage, I find myself compelled to seek media "validation" and to spend vast amounts of time trying to get reviews for my book in the press - in other words, tilting at windmills. My hope is that a mainstream publisher will take it on but I've taken this roundabout route so of course I have to accept its difficulties. The excellent reviews I've had from bloggers/writers has encouraged and supported me but there is still this ingrained belief that unless your name is up in lights (ie in black ink on newsprint in the quality press and/or the A-list top-hit litblogs) you ain't worth a look-in. How to change this perception? As a recent debut author whose first novel, Radiant Days, came out with an independent press (Shoemaker & Hoard), the reviews and press about my book has exclusively come from traditional print media (NYTBR, Washington Post, SF Chronicle and a few others). While I'm insanely grateful and happy about the coverage, even the negative, this has been surprising to me. I always thought my book was more 'a bloggers' book since I'm with an independent press and more or less unknown. My day-job is as a computer developer so I’m online and reading the blogs pretty religiously—probably way more than is heathly. And I guess, and I realize this is totally ridiculous, I felt I was somehow part of that community, just because I’d been reading them since way before my book came out. I should also point out that while the reviews resulted in a slight and temporary sales bumps, they’ve been nothing compared to announcements of readings (spam to friend’s email lists). And I’ve corresponded with other authors about this, and it seems to be agreed that unless it’s a glowing review on the front page of the NYBR, print reviews don’t directly correspond to large sales. But what they do give you, and this is invaluable, is some sort of “legitimacy” and a starting point for getting your book in the literary discourse. People I work with suddenly wanted to talk to me about the publishing process. Reading series began to answer my emails. My parents concluded I might actually be serious about writing (despite doing making the regular sacrifices for over 15 years in order to do it) once the book was mentioned in the NYTimes. etc... This might seem petty, but they’ve all been landmark events for me. I'm replying from the perspective of someone who just reads a lot - not in the industry in any way, I don't have a blog and I don't do any reviews - other than suggestions to friends/family. I read reviews everywhere - blogs, magazines, Bookmarks magazine - and then I go to Amazon. I look at the reviews there and the brief description of the book and add to my wishlist if it's something I want. Often I don't purchase there - I go to the library or a local store, but I think it's a great resource. I will say that I have found a few blogs where I realized I have very similar tastes to the reviewer - and I'm more likely to just get a book that is raved about there without much more consideration. I assume if I subscribed to a newspaper, I might do the same. I find most of my books by reading a story in a magazine or lit. journal and then further investigating the author, or through lit. blogs. The lit blog co-op and EWN, in particular, have been very influential. I've bought at least a dozen books this year that I've found through blogs. The only print reviews I regularly read are the NYTBR, some lit. journals that run reviews, and our local weekly, the Boise Weekly. I also get recommendations from other writers who know my personal tastes. I should add that my town (boise) doesn't have a very strong independent bookstore presence, but when we lived in Missoula, I regularly when to Fact & Fiction or and the stellar Shakespeare & Company for suggestions. ok, we have to give a summary of where we fit in? former bookdealer, has sold some short stories recently, no novels yet. Reader first and last though. It's probably important that I'm also not American; we do have newspaper and magazine reviews of books here (South Africa), but very few and seldomly along the lines that I like. We mostly only get leadlist, or at least top selling authors since it's all imported, so it's frustrating not knowing what's happening in the writing world in that sense. So, I can't really comment too much on the value of your newspaper and mgazine reveiws, although it seems as if people look to it for validation more than suggested reading. Blogging and online forums has changed that for me, a lot - interacting with other writers and readers from different countries has opened up a whole new realm of options regarding authors. It's the word of mouth thing, in the long run nothing beats word of mouth, I remember this from the time I spent as a bookdealer as well - people would come looking for books that friends recommended, none of them read reviews in newspapers. For myself - there's a few online sites that I like, and a number of fiction magazines do regular reviews. I've found these official reviews helpful; blogging is a boost, IMO, not a detriment. It creates more dialogue, and I've learned about interesting books and writers much faster than I would have. I do have a preference for a one-man/ woman blog - whether reviews/ commentary, whatever. The reason I'm not sure of, but I feel more at ease measuring the advice and tastes of single person against my own. Easier to follow and understand in some ways; maybe too a belief that bloggers are a bit more honest since they don't get paid for reviews? I don't know, but I'm comfortable reading blogs. Like I said, to me it's a bonus, not meant as a replacement to official paper or online reviews -I read and compare as many as I can before I make a choice. I do value my money, and don't like to spend it on too many long-shots. That, is what it comes down to. The more discourse about books the better, IMO. I am a former bookseller, but have always been and continue to be an avid reader. When I worked in a bookstore, I was immersed in book culture and was constantly talking books with other employees, reps, and customers. Once that conversation ended, along with my employment (by my choice, to pursue a different line of work), I had to become more reliant upon reviews. I find most of the books I read through word-of-mouth, via friends, or through print reviews, via newspapers or magazines. I use to rely rather heavily upon The New York Times Book Review until they decided to become weighted more heavily toward the non-fiction end of the book spectrum. I still read them occasionally, along with The New York Review of Books to see what is being published regarding books about current events, politics, and history. I also tend to trust the essays and book reviews in The Believer, to which I subscribe. And, I subscribe to the daily email book reviews of Powell's City of Books, which culls reviews from their own newsletter as well as many national publications. All of that being said, I have recently begun to switch to the reviews and recommendations found on blogs such as yours. I picked up the spring 2007 Read This! recommendation due to the link from your blog to the LitBlog Co-op site. I have picked up a couple of other books via reviews on blogs. I will also "research" a book via personal reviews on Amazon.com and on other sites to get a "feel" for whether or not a book and I are a good match, although I tend to oftentimes discount those reviews because they seem to tend toward unbound fanaticism or vile hatred. So, I do use print reviews, although I seem to be trending away from a reliance upon them. New Yorker, NY Times, Chicago Tribune, Bookworm. Steal info off Newsweek, time, BookForum, NYRB, LRB, New Republic, GQ, Esquire, Harper's, Atlantic Monthly, I forget! I've written about this subject at my blog,and while I feel for those print reviewers who are being pink slipped and undercut,I don't buy that it is all due to blogs. It's like public school funding,the arts are the first ones to take the hit,while the football team gets their new uniforms. It's all about money to the corporations who run the newspaper/magazine industry,not quality vs. quantity. I also find it peeving that there are folks who insist that most of the litbloggers out there are rank amatuers,who only put biased reviews or sarcastic ones. I've read plenty of reviews in the NYT(both the Sunday and weekly book section)that are downright nasty and actually give away the ending of the book,which is horrible to me. Even If I don't like a book/movie/TV show,I wouldn't ruin it for someone else. Also,I've seen many litblogs that are just as crafted and well thought out(Maud Newton,for one)as any newspaper or magazine section. The bottom line is,this should not be either/or. We all want the same goal,which is to help good books get the attention that they deserve. Instead of fighting each other like Jerry Springer guests,we should team up and see if we can help each other out. Oh,and as for where I get my reviews,I check both the internet and blogs such as Buzz Girl for the latest in books. I also read EW's book section(which gives a nice mix of high and low brow). I'm a former bookseller who believes in word of mouth when it comes to great books,be it in person or online. Dude, I totally flaked on posting yesterday, didn't I? Well, I was working in the Book Nerd cause -- attending a special session at the fabulous Brooklyn Public Library on starting a small business. Look out for more on that here in future. But I'm hoping all that good info for the future bookstore can marinate in my head and my notebook for a while, because I'm having a hard time concentrating for long on anything but marrying the ALP in June, and all that that implies in the meantime. He's headed out of town this weekend for some mysterious bachelor activity, while I've got my college girlfriends coming in to town for esoteric girl stuff (like champagne and dancing). So you probably won't hear from me tomorrow either... too much to do. Oh right -- blogging day. Where was I again? Folks, BEA is less than four weeks away -- do you know where your parties are?? I can tell you definitively about two: Emerging Leaders of Bookselling is planning a killer shindig from 7 to 9 on Wednesday May 30, and the Litblog Co-Op will work their usual magic on Thursday night. Stay tuned (or email me) for further details. And you can make your BEA plans and schedules at the BEA site, and the ABA site (check out the Brooklyn walking tours on Wednesday). Seriously, I expect to see you all there! 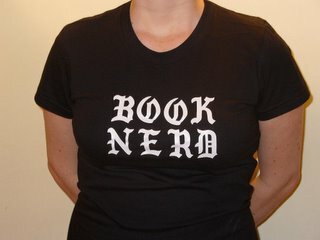 BTW reports that two lucky young booksellers will be going to BEA for free, thanks to the ABA's "twice as nice" Emerging Leaders Scholarships: Mark Bradshaw of Watermark Books & Cafe in Wichita, Kansas, and Angela K. Sherrill of 57th Street Books, a branch of the Seminary Co-op Bookstore in Chicago. Major congrats, guys -- hope to meet you here in Brooklyn! And for all of you Emerging types thinking about opening a bookstore someday -- the Prospective Booksellers School still has openings. Come a day early for the show and you can get the benefit of Donna Paz' and co.'s years of experience to give you confidence for your future venture. Definitely worth the price of admission. What else... my graphic design oriented coworker Adjua directed me to this great blog, The Book Design Review, about book cover design -- something we obsess about at the bookstore, and fascinating for arts, literature, and culture junkies alike. In local news, don't read this article from the Village Voice if you don't want to get depressed about the loss of some more Brooklyn history. Even accounting for the Voice's typical anti-establishment tone, things look grim for Coney Island. I could be wrong, but I think we'd better get out there and have our seedy boardwalk fun while we still can. Then, to cheer yourself up, head over to the LBC and check out last week's great interactions with Cottagers author Marshal Klimasewiski, including his discussion of interstitial fiction. This week heats up with the actual winner of the Spring READ THIS!, Alan DeNiro and Skinny Dipping in the Lake of the Dead. Enjoy the book talk -- I'm off with miles to go before I... go to work. Happy reading!